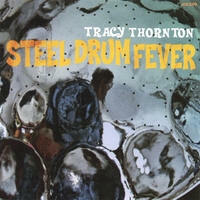 Tracy Thornton started his musical career in a high school rock band in the American state of North Carolina. Fascinated with toy drums as a child, he later made a journey to Trinidad and Tobago to play the steel pan in the Panorama competition. Some panorama performances have a kinship to hard rock if only in one element – a fast paced cacophonous sound to the uninitiated. In Tracy’s musical journey the tight connection has loosened to diverse paths. Steel Drum Fever takes the listener to many cool places. Tracy composed and arranged tracks one through seventeen. He plays the steel drum, djembe, bass and keyboards on all. Accompanied by eleven musicians on instruments such as the trumpet, tenor, alto and baritone sax, piano, violins and tabla one is pleasantly surprised to hear a range of tempos.